Home » Slider » Now Accepting Applications for the 3rd Annual Summer Kids’ Market! Is your child a budding artist, inventor, or creative salesperson? 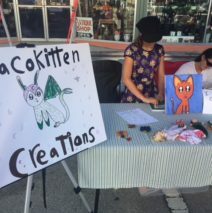 Give them an exciting new outlet for their entrepreneurial aspirations and urge them to apply for the Downtown Farmers Curb Market’s 3rd Annual Summer Kids’ Market! This summer, we want to provide young entrepreneurs a place to test their wares and learn and practice sales and marketing techniques. They can make real money and feel what it’s really like to be a business owner. Submit your KIDS’ MARKET application. Fill out the online application, and once approved, you’ll receive an email with the Kids’ Market vendor agreement. This will explain all the rules for the Market, etc. We will have 10 spaces for kid vendors, and they will be placed by application–not first come, first serve. We will provide the tent, table, and tent weights; however, kid vendors (and their designated adult chaperones) are responsible for setting up and breaking down the tent, table, and weights each Saturday. Ages are 8 and up. The fee for the entire summer session (June-July 2019) is $25. It is non-refundable for absences. Market hours for June and July are 8am to 1pm. No food products will be allowed because of insurance requirements and state regulations. This is for the Summer of 2019.